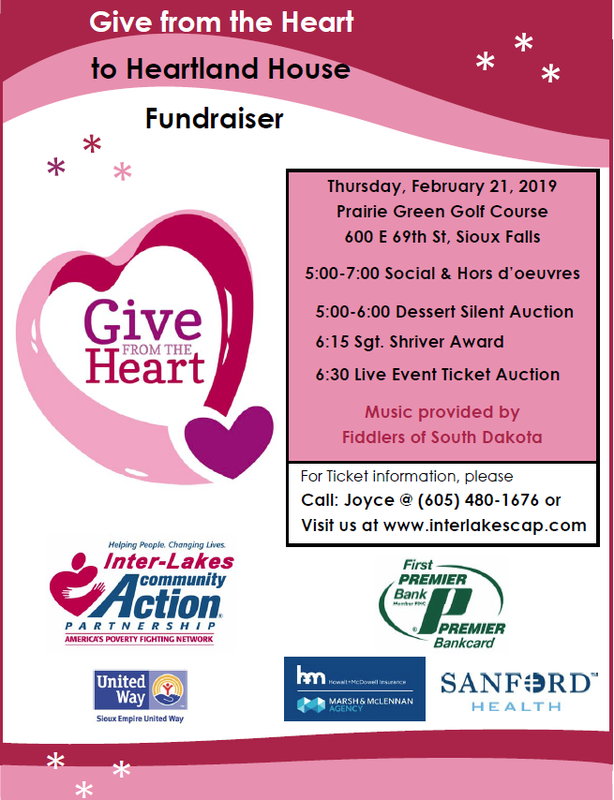 Heartland House, a program of Inter-Lakes Community Action Partnership is pleased to partner with Prairie Green Golf Course to host our seventh annual “Give from the Heart to Heartland House” on Thursday February 21, 2019. The event will include: Hors d’oeuvres program, dessert silent auction, and two live event ticket auctions. Heartland House is a Rapid Re-Housing Program that was created to assist homeless families with children in Sioux Falls. A Housing Stabilization Coach is assigned to work with each family to design and implement a personalized housing stabilization plan which may include further education, job search and placement, money management, budgeting, general living and parenting classes. Short term rental assistance is also provided. Many participants leave the program with an increased sense of self-discipline and self-worth. To sponsor a table, please contact Joyce Harmon at (605) 480-1676. To purchase an individual ticket(s) for $75, please click Buy Now below.